If that sentence brings back memories of you sitting down by your PC and playing countless hours of SWBF, then this MOC is for you. 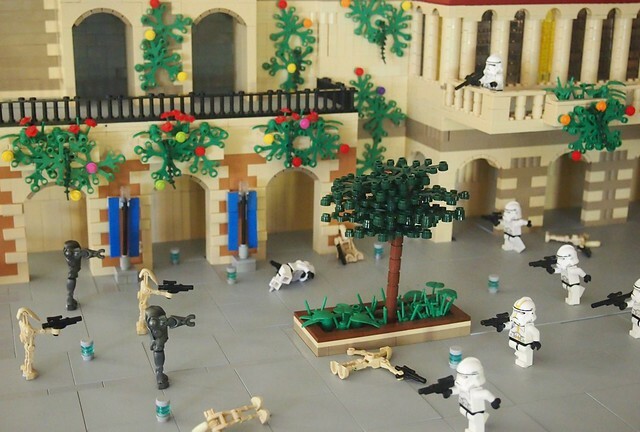 Back in 2015, Flickr user Brickwielder was participating in a SWBF Galactic Conquest MOC contest on Flickr and he decided to build this amazing LEGO Star Wars Battlefront 2 Naboo MOC. This is perhaps one of the best recreations I’ve seen of the SWBF game as it accurately depicts the architecture of Naboo present in the map of Naboo: Theed from Star Wars Battlefront 1 & 2. First off, one of the coolest things about this MOC is the fact that its scale is accurate to that of the game. If you were to squint your eyes for a moment, somebody could actually tell you that you’re looking at a blurry screenshot of the game. This is partly due to the fact that Brickwielder used a very nice color scheme for the build. Most builders, when they decide to recreate Naboo, rely heavily on plain tan bricks, however, Brickwielder realized that the sand orange bricks lend themselves perfectly to the Naboo architectural design. Nonetheless, as he points out on the description of the build, he kinda forgot to order more sand organe bricks and had to use dark tan bricks. Another nice addition to this MOC is the addition of small plant pieces to create foliage in the city. The balconies/arch ways from the main building look spectacular with those leaf pieces attached to them. Similarly, that small island in the middle of the concrete looks just like what you’d seen in the game. Finally, one detail that SWBF fans will appreciate is the inclusion of the bacta tanks scattered all around the floor. If you’ve played the game, then you’re aware that when you take down an enemy you can either get a bacta tank or ammo box. It seem to be that our clones will only be getting bacta this time though. 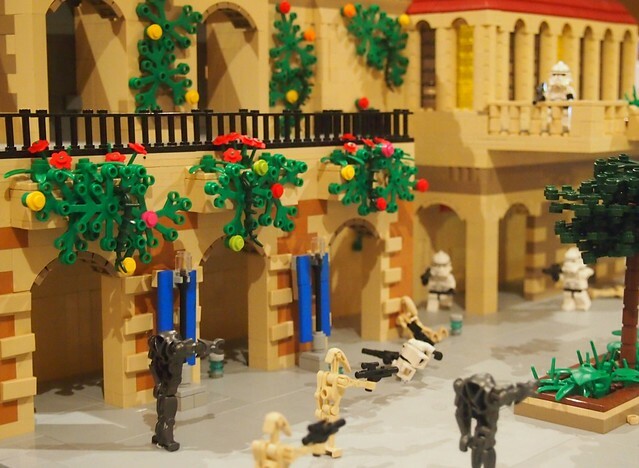 All in all, this is a spectacular MOC and I suggest you take a look at other great builds that Brickwielder has created. If you’re not a Star Wars fan, then don’t worry as he builds things from other themes as well. Next articleLEGO Fantastic Beasts Newt’s Case of Magical Creatures (75952) Revealed!